Location: In the Palmyra-Macedon Aqueduct Park. Starting from the intersection of Routes 21 and 31 in Palmyra, proceed west on Route 31 (West Main Street) for 0.7 of a mile. The entrance for the Palmyra-Macedon Aqueduct Park is located on the north side of the road. From your parking spot walk back towards the park entrance. A short distance before reaching Route 31, turn right (west) onto the Erie Canalway Trail, a six foot wide gravel trail. Follow the trail to the west for 0.1 of a mile to an old stone towpath bridge over Ganargua Creek. This bridge is part of the Mud Creek Aqueduct. You can view the spillway from the bridge. 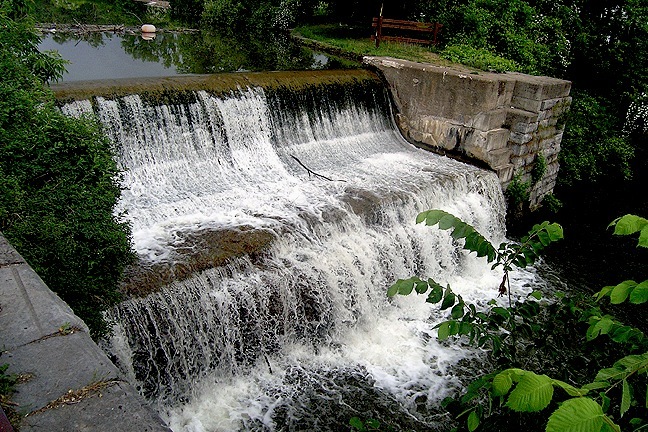 The spillway is best seen in the late spring. During the winter months the canal is drained and the spillway is then dry. When the Erie Canal was originally built, a wooden aqueduct carried it over Ganargua Creek, once called Mud Creek. The three arch stone bridge is the original towpath for the canal, with the now crumbling supports for the aqueduct located just north of it. When the canal was widened and straightened the aqueduct was removed and surplus canal water was allowed to spill into Ganargua Creek creating the 16 foot high Palmyra-Macedon Spillway. The Palmyra-Macedon Aqueduct Park is a Wayne County Park. 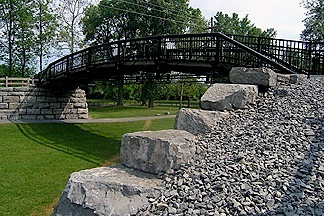 The historic site features the reconstructed 1858 Aldrich Change Bridge, the oldest iron bridge in New York State. The park also has a baseball diamond, boat launch ramp for the Erie Canal, picnic pavilions, grills, play equipment and is adjacent to Erie Canal Lock Number 29. The old power house that once provided electric power to the lock can also be seen. For a Map Quest map of the area click here. Copyright © 2008 by Scott A. Ensminger.